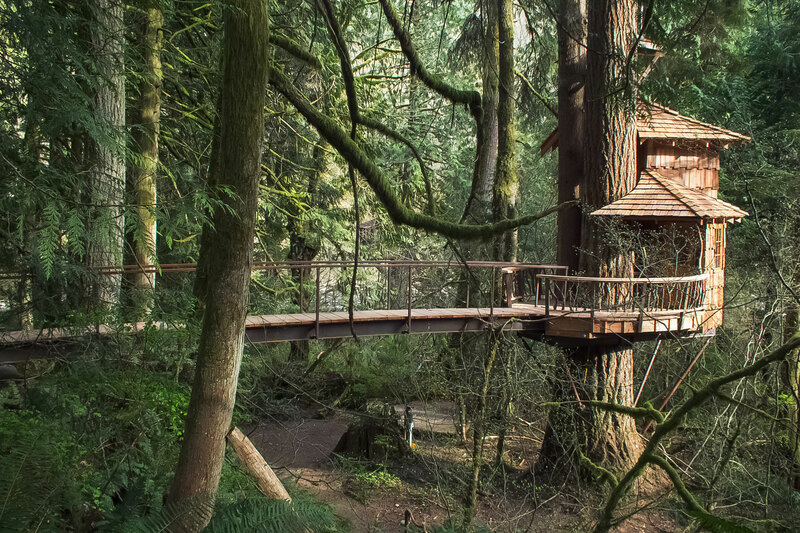 Nestled in a lush forest 30 minutes east of Seattle, TreeHouse Point is the perfect place to immerse yourself in the natural beauty of the Pacific Northwest. TreeHouse Point is home to six iconic, rentable treehouses; a central Lodge; a multi-purpose event space; and two cedar-lined bathhouses. All indoor spaces are heated, and we provide bedding, towels, and even shampoo and conditioner, so come prepared as you would for a typical hotel stay. Complimentary Wi-Fi, books, board games, snacks, and dishware are available inside the Lodge for guests to enjoy. Each morning, our talented cooks prepare a delicious, wholesome breakfast in the Lodge. For descriptions of each treehouse/room and information on rates, availability, and reservations, please fill out the following form. Once you complete the form, we will send you an email containing these details. Still have questions about what to expect on your visit? We put together a handy guide to staying overnight at TreeHouse Point—click here to walk through a stay in the trees. Please note that, in order to foster a romantic and restful ambience, we do not permit guests under 13 years old or pets for overnight stays. Children of all ages are allowed on tours and at private events. For information on tours, please visit our tours webpage. Thank you for your interest. We look forward to seeing you in the trees!